Skin the squid and score the inner part to form criss-cross pattern. Season with salt, sugar and pepper. 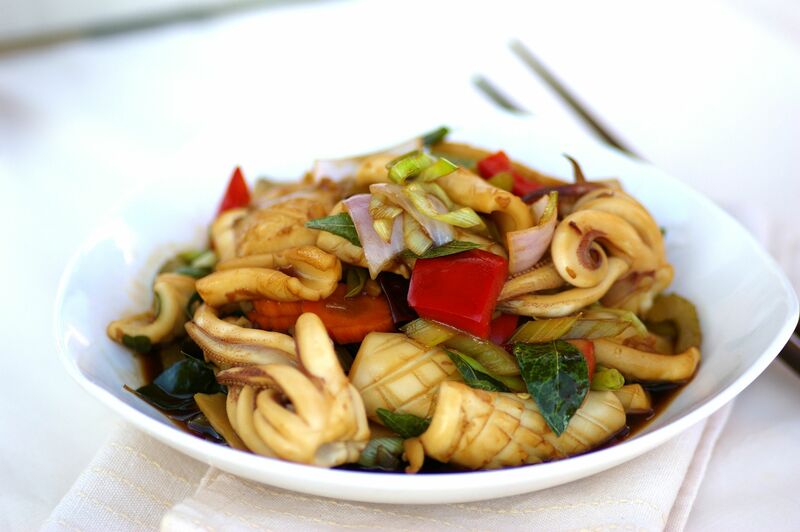 In a wok or large enough saucepan, bring water to boil and scald the squid for just a few seconds. Remove and drain well. Cut into bite sizes. In a wok, heat the sesame oil and fry the garlic until lightly coloured. Add ginger and dried chillies, and fry until aromatic. Add the celery, leek and capsicum. Toss and fry briefly for 10 to 20 seconds. Stir in the sauce ingredients and bring to a quick boil. Once the sauce thickens, return squid to the wok and stir-fry over high heat for a few seconds. Dish out and serve.